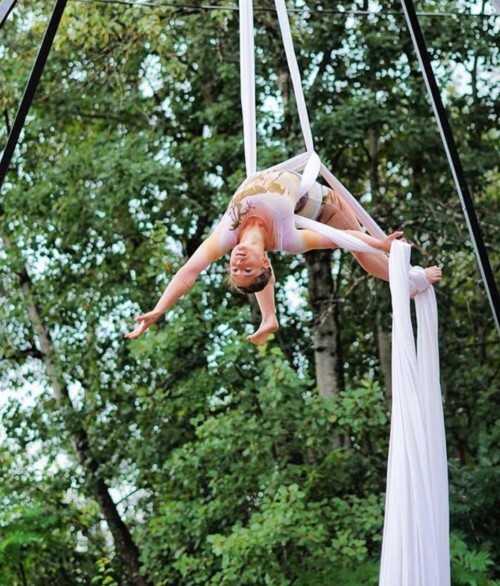 Theatre Arcturus is an award-winning theatre company that creates visually stunning plays that weave aerial arts into the world of the story. Characters work in harmony with gravity but are not bound by it. They may climb or take flight at any moment. This is aerial theatre, where the boundaries of physicality and truthful storytelling are pushed, and sometimes the world turns upside down. >Our local magician returns with a new show, packed with even more illusion! Sawyer Bullock is an award winning illusionist, mentalist, and speaker. At only 20 years old, Sawyer has performed across Canada, in Las Vegas, the Dominican Republic, and on his own television show. His unique and contemporary blend of wit, sleight of hand, psychology and showmanship is in serious demand for audiences seeking a high caliber experience of not only wonder and mystery- but straight up fun. Prepare to laugh as much as you scratch your head, as well as talk about the show with friends for years to come. We warmly welcome The Neema Children’s Choir to the Creemore Children’s Festival this year. They are a group of children from Uganda, ages 8 to 16 who have come to Canada to raise money to send orphaned children, like themselves, to school in their homeland. The goal of The Neema Children’s Choir is to make a better life, through education, for the children of Uganda, since over 50% of Uganda’s population is under the age of 15 and most of those children are orphaned due to poverty, civil unrest and HIV/Aids. When in Canada, they perform for donations and sell jewelry, CDs and handbags to help reach their goal. The Neema Children’s Choir is part of a non-profit organization called The Neema Child Project. Our friend, Clive is back to the festival with his brand new children’s album. Sing along to his silly, informative and catchy original tunes. With his background in children’s educational media, Clive VanderBurgh believes he has written more songs about shapes, numbers and the metric system than anyone else in the world. He promises he won’t sing any of them at the Creemore Children’s festival. Well known for his first Juno nominated children’s CD, “Today’s Special” cast album, he has more recently been working on his 2nd CD. Clive is a Professor Emeritus in the RTA School of Media at Ryerson University in Toronto. He was a producer/director at TV Ontario where he was responsible for creating, producing and directing children’s series including Today’s Special, Math Patrol, MathMakers, McCabe Mysteries and Roots and Wings. Clive also produced, directed and wrote hundreds of musical segments for CBC’s Canadian Sesame Street. Check out our Bubbleology Booth on Mill Street! Watch as the Bubbleology team manipulates them into all sorts of impossible shapes that they never thought possible! Witness massive HUGE bubbles, bubble carousels, bubble volcanoes, bubble chains, 3D SQUARE bubbles, the friendship bubble arch, a person in an actual tall massive bubble, plus see who can blow a bubble out of a bubble while their standing in a bubble. Hard to say I know! Don’t miss this main stage performance. You may even be surprised to see bubble magic happing along our streets throughout the day, too – mega bubbles, millions of bubbles and ameba shaped bubbles floating above wobbling into all sorts of shapes and floating away, all with the swipe of our magic wand. Imagine being chased by a 50ft long bubble!